We have always dreamed that No Crowds would develop into a place for like minded travelers to share discoveries. Today, we moved closer to that goal with the addition of a report on a visit to Paris by Trish, a savvy traveler if ever there was one. We've been telling her for a long time that she doesn't need to write a lot (she's busy - just like you), just pass on a list of highlights and she's done exactly that. So enjoy these wonderful suggestions (we can't wait to try the Laiterie St Clotilde) and be sure to send us your own discoveries. I had a great time in Paris. - thank you for all your tips and here's some feedback in shorthand. · Le Petit Lutetia (Lutetia is the old word for Paris according to the waiter) – old fashioned, good food, sat with older formal Parisian couples who live in the chic 7th Ar. I was actually staying about 200 yards directly up the street in Rue Vaneau! Again around 45-50 euros per person with 2 courses and wine. · Restaurant Laiterie Sainte Clotilde The best new find!! I always discover the good places by walking past, seeing a full and buzzing place and just trying it. Again up the road from me at 64 rue de Bellechasse in the 7th, I found Restaurant Laiterie Sainte Clotilde. So named for the magnificent catholic church a block away where I went to moving Ash Wednesday High Mass. Restaurant has been open year and a half. The young female chef is half English and was looking over cookbooks at the bar after dinner discussing recipe ideas with the owner for a menu that changes every few days. Again about 40 euros for 2 courses and a few glasses of wine – this was by far the best food I had in Paris. Not traditional – imagine a French River Cafe – the chocolate cake was a recipe from the owner’s great aunt! · Terminus Nord. My Parisien friend took me to dinner one night to a restaurant right opposite Gare Du Nord called Terminus Nord. Full of locals – it is the typical large brasserie with traditional food, the ubiquitous seafood platters etc. Food not that amazing but a great convenient fix before or after your train journey and not too expensive.
. Lunch at Maillol Museum was a treat in a quirky basement restaurant. From a very contemporary menu I had an excellent lentil salad served in a glass jar. · A must see - Monumenta - every year in the ‘off season’ at the Grand Palais, a leading international contemporary artist is invited by the Ministry of Culture and Communication to create an exceptional new work for the 13,500 m² Nave of the Grand Palais. This year it was the French artist Christian Boltanski. I waited 40 mins to record my heartbeat for his project that will see 50,000 human heart beats recorded and placed in a digital library in Japan for a little piece of history. I have a DVD copy which I am going to upload on my kids I-pods for when they are missing me! 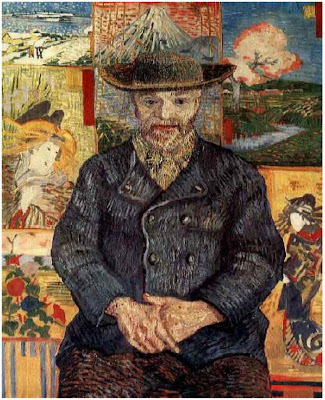 · The best Van Gogh painting NOT in the Royal Academy show is actually in the Rodin Museum – I was admiring the portrait of Le Pere Tanguy there and noticed in the fabulous show at the Royal Academy a week later, that it is referred to in the Japanese room with an only a postcard image.